“Daily life” is a catchword in historiography for many of the things that historians traditionally have not considered, or have not been able to study due to gaps in historical records. In archives and archaeology, the record of daily life activities is often very slim, even for times and places where both archives and archaeology are relatively rich. Egypt is one such place. “Daily life” also implies a potential focus on the poor as well as the wealthy, on the oppressed as well as the empowered. The methodology for creating this focus remains difficult, even for ancient Egypt. For example, the tremendous preponderance of cultic material–from pyramids to shawabtis–in the remains of Egyptian antiquity, requires a great infusion of speculation in order to fill out the gaps in our knowledge of the quotidian. The records that remain, inscriptions and monuments, were not necessarily created to document what we would like to know about ancient daily life. Scientific excavations of ancient settlements, for example, such as the townsite of Deir el-Medineh once inhabited by the workers who created the tombs at nearby Thebes, is a relatively recent development in Egyptology. The situation is somewhat different for Late Antique and Early Islamic Egypt, which I will refer to as “early medieval.” Everyday documents abound, in the form of papyri, which can begin to round out an image of life in those periods. The Geniza documents, magisterially analysed by Goitein, are the source of much of what we can know about the life of the Egyptian Jewish community. Excavations at Fustat have given us a glimpse of the early Islamic city, where the rich and poor evidently lived side by side. Coptic Egypt has yielded innumerable tombs containing ordinary, everyday textiles and fragments, primarily from clothing. By merging these materials and other approaches to the early medieval period in Egypt, it will eventually be possible to develop a clearer understanding of daily life in those times. In Coptic textile studies, development of an “everyday life” approach has been hampered by certain limitations on the corpus of medieval textiles available for study. The most significant limitations have to do with how these textiles are found, and by whom. There are an estimated 150,000 so-called “Coptic” textiles in the world’s museums, although it is not clear how one arrives at such an estimate. 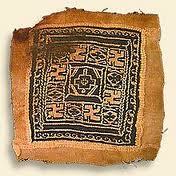 Virtually all of these textiles were unearthed unscientifically, usually by antiquities dealers, and illegally. Excavation reports for sites that have produced large numbers of textiles are very rare.